In the previous post I shared with you my discovery of wooden flats from Russia. Now we can look at cavalry and artillery as well as further evolution of the designs to include outlining. These lancers are quite nicely animated. However, the targeted scale of 45mm to the eyes was overshot as the calculation for the cavalry didn't take into account that a charging rider wouldn't be standing straight in the saddle. The figures are closer to 1/35 and wouldn't look out of place in a 54mm army. So I just test painted a figure as the 17th Lancers. As with the French infantry, the figures are blanks and thus also where and how to paint the details is up to the painter. In this case I chose to rotate the rider's torso somewhat. 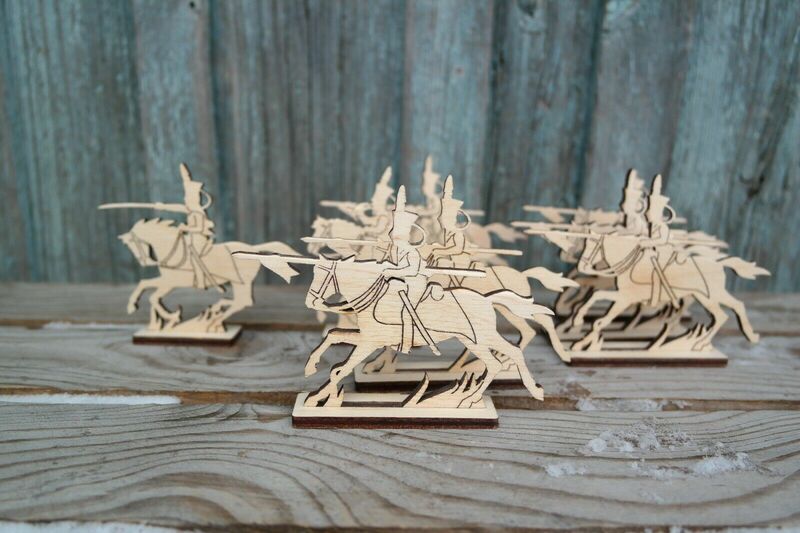 For the next order, I asked Yevgeny if he could add plumes to the lancers for a bit more of a Napoleonic look. He obliged by not only doing that but adding outlines to the figures as well as posing them differently. And we downsized everything to 42mm in order to match up better with the Nowikoff home casts. The rider has been reduced in size but to my eyes the horse came out a bit elongated. Or perhaps it's the shabraque, or both ? Regardless, it's still a vigorously posed and pleasing figure. The outlines definitely simplified the painting (or would have had I not chosen the gaudy Red Lancers) although how much or little detail to give the horse is still up to the painter. And lastly, Russian styled artillery for the Kingdom of Novgorod. I quite like the design of this cannon as the three part assembly of gun barrel and wheels adds a surprisingly good illusion of depth relative to a completely flat gun. Hope you enjoyed viewing these. The painting has been challenging but quite rewarding. Beautiful results. A clever and skillful paint job. Thanks very much, Unlucky General ! AA joy to look at! These remind me strongly of some printed card figures that I had as a kid, the sort one punched out of a book. I's better stop looking and go paint some semi-flat PA castings. Thanks, Ross. You're right, they do have a certain paper soldier look to them ! The difference is the thickness also gives an illusion of 3Dfrom any angle other than edge on. They painting is very good. An entire army of these figures will be impressive. The new horse is very close to Nowikoff's 54mm mold "Horse #3". Thanks, Rahway. I agree, an army is going to look great. My objective is to get there, although some of my cavalry units at least will be tin flats.